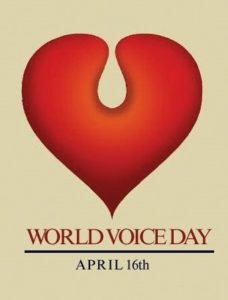 Tuesday, April 16, at 6:30 p.m.
For the Center’s annual World Voice Day celebration, the Palladium stage is transformed into a nightclub-style setting where amateur and professional singers alike are invited to perform songs of their choice. Singers may bring their own instruments, CD or MP3 backing tracks, or sheet music for the piano accompanist. All ages are welcome, along with family and friends, but participation is limited to the first 30 singers to register starting at 6 p.m. The stage setup includes table seating and a cash bar.